We collected $300.00 for Toy for Tots and lots of toys. Thanks everyone for donating. The party was fun. Have a safe Holiday and Happy New Year. Thanks Sargeant DeMilia for the presentation and Advantage Interests for hosting the event last night. Anyone who is interesting in information on last night's event, see the website below. I’m happy to share with you some exciting news. Soon, our SFPE Chapter will be joining with SFPE at the 2018 SFPE Annual Conference & Expo, which is shaping up to be our strongest annual conference to date. This two and a half days conference (October 28-30) with post optional Professional Development Seminars (October 31 – November 2) will provide fire safety and fire protection engineers with the knowledge, resources and connections that they need to excel. I would like to personally invite you to join me and participate in this engaging conference. Don’t miss your chance to network with other fire safety and fire protection engineers in the vibrant and beautiful music city capital of the world, Nashville — at the heart of our SFPE North America Chapters — and further your career and connections. The Fire Service Subcommittee is proud to announce that there will be scholarships for up to 10 full-time fire service personnel that will cover registration for the 2018 SFPE Annual Conference & Expo in Nashville, Tennessee, this October 27–November 2. Application requirements and forms can be found at the below link. Applications are due August 10, 2018. In addition to the scholarship, the Fire Service Subcommittee is sponsoring a dedicated track at the annual conference focused on fire service. Topics in this track help to bridge the gap in knowledge needed by both the fire protection engineer and fire service personnel. See the conference agenda for additional information about this event and the speakers involved, link to website below. SFPE National is asking for volunteers from Licensed PE Members. As background, the October 2018 administration of the National Council of Examiners for Engineering and Surveying (NCEES) fire protection engineering professional licensing exam will be the inaugural administration for the most recent exam blueprint. Upon completion of the October 2018 exam, the cut score, which is the lowest raw score required to pass the exam, must be established. WHAT: A procedure called a standard-setting study is used to establish the cut score for benchmark exams or for exams to which the equating process is not applicable. The benchmark exam is the first administration of a new exam or the first exam after a specification change. For subsequent administrations, the equivalent standard is maintained by statistical equating. WHO: The standard-setting study is conducted with 10-15 practicing licensed professional engineers who are familiar with the level of knowledge a minimally competent candidate should possess to satisfy this step in the licensing process. This cadre must be diverse in field of practice, business sector, years, of experience, gender and geography. Volunteers will be evaluated and accepted on a first come, first serve basis, with a need to ensure an inclusive and representative distribution. WHEN: The cut score session will take place in on November 28-29, 2018. Both days will be all day sessions and volunteers must attend both days. Anyone interested in participating or nominating someone from their company to participate in this exam standard-setting study, can please feel free to contact me, Mr. Tony Militello, PE., at: Anthony.j.militello@navy.mil. Thank you to all past officers and board members for your support of the society. Larry was highly respected as the consummate professional in how he dealt with his customers and others in the fire protection community. Larry always continued to improve his knowledge through education, training, and contributions to professional societies and technical committees. After his early years in the business in the Dallas Fort Worth area Larry moved to Houston in1978 and became an instrumental part of the early success with Webb, Murray and Associates. Larry moved to Dooley Tackaberry in 1996 and finished his career there. Since 1970, Larry had worked in a variety of fire protection roles including Consulting, Project Management, and Business Development. Most of Larry’s experience was directly related to the petrochemical, offshore, and power industries. He held a B.A. in Fire Prevention Technology and Fire Administration and served as Chair of the NFPA 750 Standard on Water Mist Fire Protection Systems. He also was a Committee Member on the NFPA 15 Standard for Water Spray Fixed Systems, the ISA-SP84, Programmable Electronic System (PES) for use in Safety Applications Standard, and ISA-SP12.13, Performance Requirements for Combustible Gas Detectors Standard. Larry was also a member of the American Society of Safety Engineers and Instrument Society of America (ISA). Larry loved life and tackled his hobbies of fishing, golf, dirt track racing and traveling with the same intensity and dedication that he gave to his professional life. Larry also was highly involved in his church and family life. Larry and Lina were on the way to one of their grandchildren’s school event when the accident occurred. Larry and Lina are survived by their daughters Michelle Owen and Denise Perry and seven grandchildren. Larry was a benchmark in the fire protection industry and he will be greatly missed. 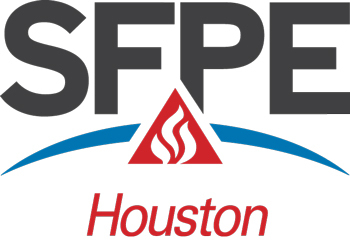 The Houston SFPE Chapter has been awarded the BRONZE Chapter Excellence Award. This award recognizes our chapter’s accomplishments in demonstrating excellence in contributing to the needs of the members and the Society. To promote fire protection engineering as a career path, Will Clay and Rob Hicks spoke to the Director of Engineering Program at Memorial High School and David Fiedler spoke to Fire Protection Engineer students at University of Maryland. Mike Crawley shared his expertise at the NFPA expo – his topic was fire protection in health care. Peter Rollinger offers his experience to the Construction Industry Council. Also, thank you to the Houston SFPE Chapter board members and officers for sharing their time and experience. The award will be presented on Sunday, November 8th during the SFPE Annual Business meeting from 3:00 pm to 5:00 pm as part of the 2015 North America Conference & Expo: Freedom to Design being held November 8 -13 at the Loews Hotel in Philadelphia, PA. If you plan on attending the North America Conference & Expo and will be in Philadelphia on November 8, please contact me at president@sfpehouston.org. It would be good to have a representative from the Houston chapter to accept the award.